Alfred Hitchcock was one of the most well-known film directors in the 1950s and 60s when he directed a string of what are now classic films. But his fame and popularity at the time was substantially derived from the weekly half-hour anthology television show that he produced and hosted, Alfred Hitchcock Presents (1955-62). More than anything else, it was probably this series that made him popularly known as “The Master of Suspense”. The show featured top stars from stage and screen playing the dramatic roles, and it won or was nominated for a number of prestigious awards. Of the hundreds of episodes in the series, Hitchcock directed only seventeen, but the entire series bore the stamp of Hitchcock’s ingenious thematic and presentational style. And of course each episode was personally introduced by host Hitchcock, himself, right after the signature opening theme music, “Funeral March of a Marionette” (by Charles Gounod). Hitchcock’s opening remarks were invariably dryly ironic about the events that the viewer was about to see. 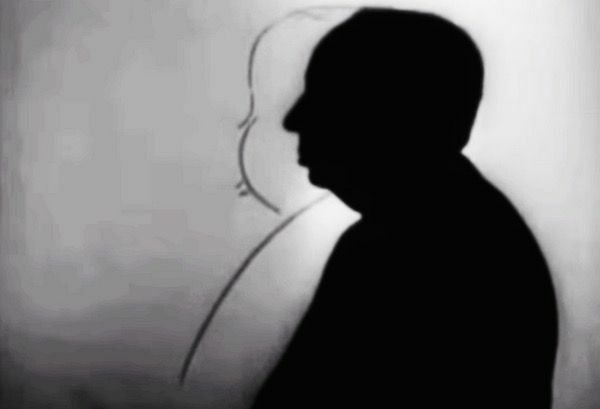 Hitchcock would also appear again after each drama ended in order to offer some closing reflections on what had just happened. This often included sardonically solemn assurance that any perpetrator of a crime who may have appeared to have “gotten away with it”, was subsequently arrested by the appropriate authorities. Such assurances were presumably a mocking deference to motion picture and broadcast codes that were supposed to uphold moral principles concerning what was presented to a wide audience. But such remarks also fit in perfectly with Hitchcock’s dry, whimsical persona. In 1962 the Alfred Hitchcock Presents program was shifted from 25-minute episodes to 50-minute episodes and renamed The Alfred Hitchcock Hour (1962-65). The new series had essentially the same format as Alfred Hitchcock Presents, but now with more time to spin out each suspenseful tale. A key common theme in much of Hitchcock’s work is the notion of mistaken identity. Sometimes an innocent protagonist is misidentified by the authorities or by threatening agents. And sometimes the protagonist, him or herself, misidentifies another person who has an entirely different identity than had been first thought. These misunderstandings always boil down to key questions concerning (1) who we want others to believe us to be, and (2) who we think we are. Of course many of us often have somewhat different guises in different social situations, and we want to present ourselves in the most favorable way we can in whatever context we find ourselves. So this, too, can involve some degree of concealment or misrepresentation, and this factor also complicates the narrative of mistaken identity in these stories. Notable examples of this misidentification theme in Hitchcock’s feature films include The 39 Steps (1935), Saboteur (1942), Notorious (1946), Vertigo (1958), and North by Northwest (1959). And this theme repeatedly appears in the television episodes, too. Another common element of these stories is the vaguely noirish atmosphere that often creeps in on the protagonist(s) as the story progresses. Although not usually fully qualifying as film noir, these stories share with that genre the uncomfortable feeling that the world has suddenly become a little more obscure and eerily threatening than had been thought. This, of course, enhances the irresistible suspense. “The Glass Eye” (Alfred Hitchcock Presents, Season Three: Episode 1, 1957), written by Stirling Silliphant and directed by Robert Stevens. "Lamb to the Slaughter" (Alfred Hitchcock Presents, Season Three: Episode 28, 1958), written by Roald Dahl and directed by Alfred Hitchcock.